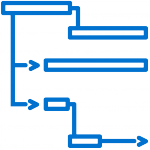 Effective project set up is an essential part of establishing a robust, successful and scalable operation and for Percepta is fundamental to the service we deliver for our Clients today. Our 16 years’ experience of Contact Centre transition and set up spans across the globe and our dedicated and highly experienced project management team have worked across multiple locations from North America to South Africa and China. Despite a vast mix of locations and cultures, Percepta’s project management philosophy has been used consistently across each set up, from initial scoping and project plan creation through to implementation and launch. We know it works. Our highly trained and skilled team faces a fresh set of challenges for each project, but works tirelessly with our Clients to ensure both a smooth implementation process and a seamless transition to “business as usual” operations. 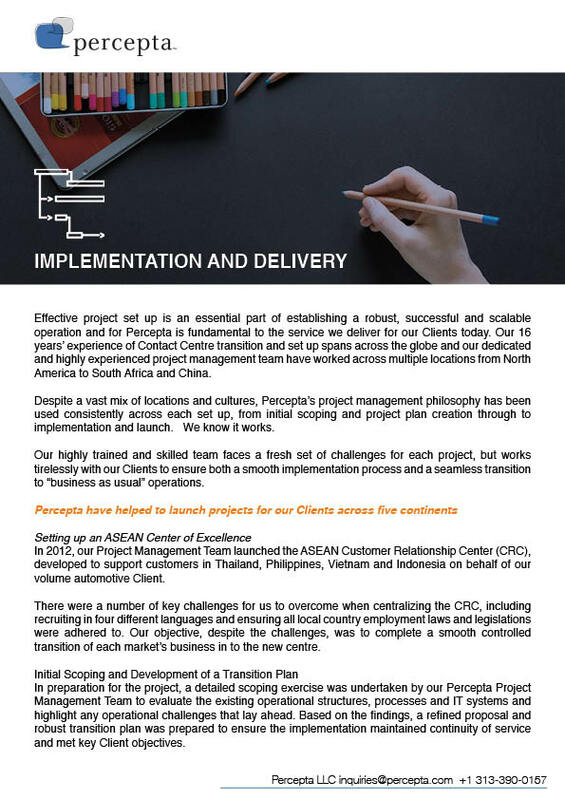 In 2012, our Project Management Team launched the ASEAN Customer Relationship Center (CRC), developed to support customers in Thailand, Philippines, Vietnam and Indonesia on behalf of our volume automotive Client. There were a number of key challenges for us to overcome when centralizing the CRC, including recruiting in four different languages and ensuring all local country employment laws and legislations were adhered to. Our objective, despite the challenges, was to complete a smooth controlled transition of each market’s business in to the new centre. In preparation for the project, a detailed scoping exercise was undertaken by our Percepta Project Management Team to evaluate the existing operational structures, processes and IT systems and highlight any operational challenges that lay ahead. Based on the findings, a refined proposal and robust transition plan was prepared to ensure the implementation maintained continuity of service and met key Client objectives. We initiated the project with a formal ‘Kick Off’ meeting, bringing together the Percepta team, project sponsors and key stakeholders from the Client. As with every Percepta project, we were careful to record all team responsibilities, dependencies and milestones for future review. For the ASEAN project, it was agreed that steering group reviews and key functional work stream meetings would be set up to update the team on the progress of the plan and focus on deliverables from the functional areas, including HR, IT and Operations. In order to ensure launch success, it was agreed that each of the four markets would transition individually in a controlled manner to the new center. This would include recruitment of the new team, IT deployment, and training design and delivery. For each market, we had to ensure that we took language and culture differences into consideration. Recruitment, for example, was carried out in both English and then in the local language to ensure that there were no misunderstandings. Following the launch of the first market, a period of post implementation monitoring was completed to ensure the market was stable. This was repeated in line with the overall plan until the full transition was complete, and all four markets were together in the center. Following a review of each market to ensure set up was a success, the project was officially completed and our Project Management team were ready to hand the Center of Excellence over to the Operations team. During this transition to ‘business as usual’, all operational KPIs and SLAs were monitored to ensure a steady operation. We concluded the project with an ‘invaluable lessons learned’ session to identify any key areas of improvement. Overall, the implementation and launch of the ASEAN CRC was considered a complete success – and as it stands today, is one of the highest performing across our Client’s business!